Whether you’ve owned many horses in the past or you’re new to the world of racehorse ownership, we have a range of ownership opportunities that help you get your heart racing. Our most popular ownership option is sole ownership, which means that your horse is owned personally by you, giving you all the of the advantages and benefit of owning a racehorse, such as stable visits, owners tickets and feedback on your horse’s progress on a frequent basis. As a sole owner, you’re allowed to relay your thoughts and ideas about where your horse will race so that you’re in the driving seat. Another ownership alternative is joint ownership or a partnership, made up of as many separate owners as you desire. 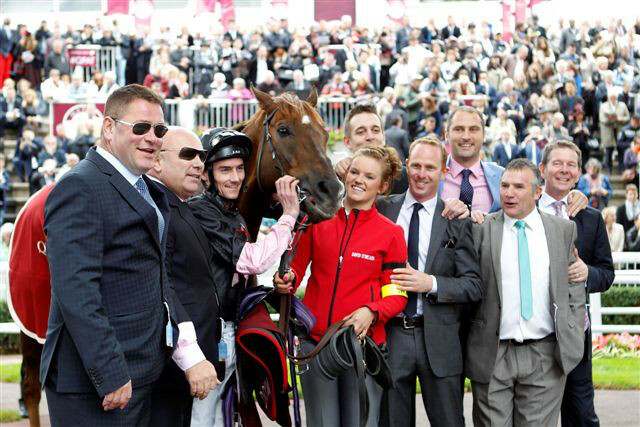 At David O’Meara Racing, we cater to a lot of racing partnerships and syndicates throughout the UK, which is an extremely practical way of getting the full thrill and excitement of racing for less. Partnerships and syndicates receive all the same benefits as sole ownerships, but with the costs diluted between partners, and any stable visits or phone or email contact must be proportional and within reason. Whether you are looking to become an owner personally, via your business or as part of a syndicate, please make an enquiry to learn more information on ownership and pricing. Should you have any other specific requirements or ownership setups, feel free to contact us to discuss this in more detail. Get your heart racing!